If you are looking for a book to read on the beach this holiday season, one could do worse than For Bread Alone, Mohamed Choukri’s memoir of his early life, before he learned to write and before he made the acquaintance of the literary-minded expatriates of Tangier, such as Tennessee Williams. Choukri ran away from an abusive home and spent his adolescence on the streets of Tangier in northern Morocco, making a living by petty crime, ending up in prison, and eventually meeting a teacher who taught him to read and write. His father committed horrific acts of violence against young Mohamed and his siblings, only one of whom survived to adulthood; his mother made little effort to protect the children, making it clear that her only loyalty was to her husband, and his extended family was no better. Anyone who reads the book can understand why the author felt that literature was his only real friend; when he died in 2003, he left all his money to a literary foundation, and before he died, he gave enough money to ensure financial support to the servant who had taken care of him in his old age. Although the circumstances are usually not as extreme as those described in For Bread Alone, there are plenty of reasons a person might want to leave his or her assets to someone other than blood relatives. An estate planning lawyer can help you compose a will that ensures your wealth is passed on to the people and causes that matter the most to you. You may have heard that certain relatives automatically inherit a deceased person’s estate, but that is only true if the person does not leave a will. You simply specify in your will which parties you want to inherit your estate; they can be family members, people other than family members, or even charities. The most difficult relative to disinherit is a spouse. 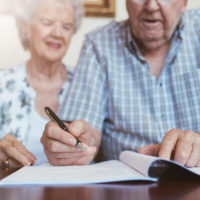 If you are married and do not wish your spouse to inherit anything from your estate, that provision is only enforceable if your spouse has signed a prenuptial or post-nuptial agreement waiving their rights to inherit. Sometimes people who wish to leave their money to a person not related by blood will adopt the person as an adult. Doing so establishes the person as a legal family member; it might make it easier for the adult adoptee to inherit from the decedent, but it is still possible for the person to inherit even if there is no formal adoption. Florida has very few restrictions regarding adult adoption; as long as both parties are at least 18 years of age and they both consent, the state of Florida is unlikely to refuse. All families are different, and all wills are different. Contact Mark R. Manceri in Pompano Beach, Broward County, Florida to discuss your questions if you wish to leave your estate to someone other than close blood relatives.